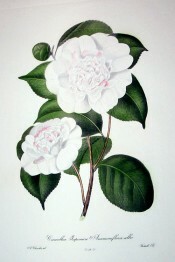 A cultivar of Camellia japonica L. Of similar shape to ‘Anemoniflora’, which see, the flowers are white with occasional striping and spotting with pale red. The outer petals are large and spreading, the inner small, irregularly shaped and numerous in a dense mass. [ICR]. 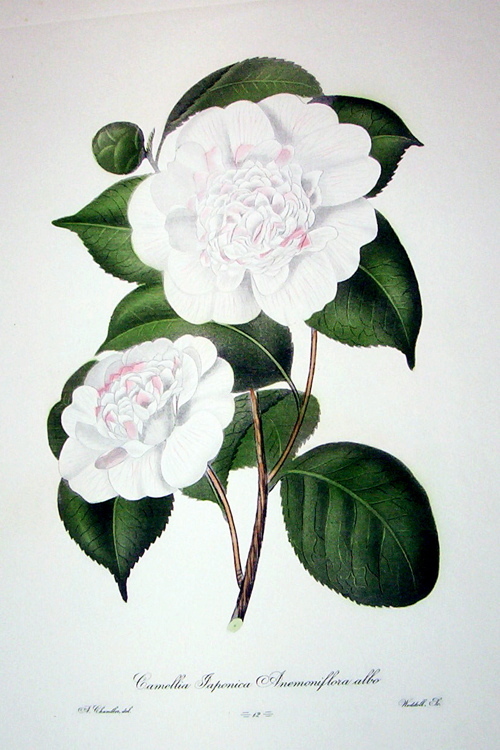 ‘A vigorous shrub; bud very large, depressed at the summit, and almost round; scales green and shining; flower very full, very large, four and a half inches in diameter, of a dazzling snow white; exterior petals large, foliaceous revolute, sometimes spotted with red at the claws, and irregularly arranged; those of the interior rows, long, erect, cut in a ligulate manner, united and compressed into a large flattened ball, in the middle of which are confounded a few sterile and almost invisible stamens.-Superb.’ [Berlèse Monography p.46/1838]. Introduced in 1819. [ICR]. Chandler pl.21/1831. Listed in all published catalogues [T.197/1843]. ‘A fine seedling variety, raised by Mr. Chandler, of the Vauxhall nursery.’ ‘Anemoniflora alba’ was marked ‘x C’ in this article by ‘G.A.L’ in the Horticultural Register. Although this book originally belonged to James Bowman, these notations may indicate that it was grown by the Macarthur family, including William, earlier than 1843. [HR p.635/1832].